Along Fleet St where the gates to London City once stood is a large statue of Queen Victoria. Around the base of that statue are small stories showing details of her reign. On one side id=s this relief showing her taking a carriage to Guild Hall. Worth standing in the middle of the road to see up close. Very good. Glad you survived the crossing! Most definitely worth clicking on to enlarge the image. I've seen the statue but never noticed this detail. There is quite a lot of detail here. I'll have to look for this on my next trip. It is quite beautiful and thank you for standing in the road to show it to all of us! 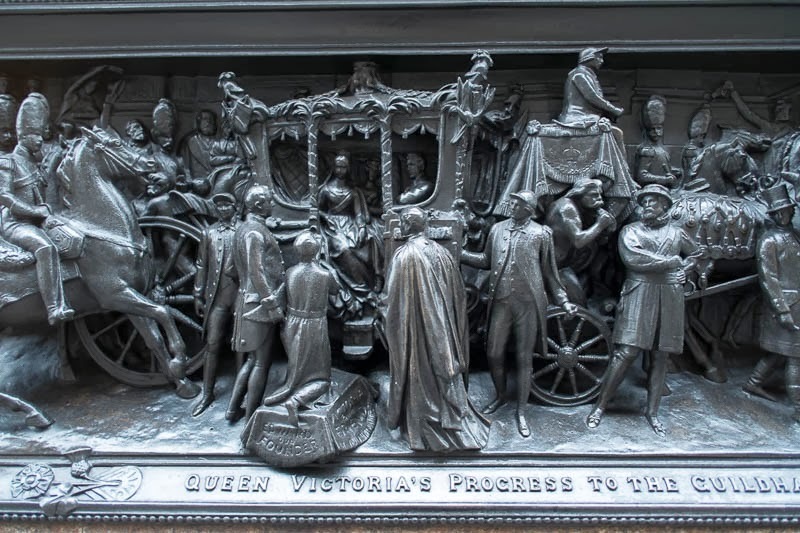 Where we might walk I see that Victoria 'progressed'.